A dermal cylindroma is considered a benign skin appendage tumor. It is also known as dermal eccrine cylindroma. The tumor predominantly forms on the scalp and forehead and may be solitary or occur in groups. Furthermore, cylindoma may also develop together with spiradenomas and trichoepitheliomas. Solitary cylindromas are sporadic and, therefore, not associated with heritage. On the other hand, in people suffering from multiple tumors their occurrence is autosomal dominantly inherited. Multiple tumors may grow and form a structure that quite resembles a turban. This is why such bunch of tumors is often referred to as turban tumor. In spite of being benign, some cylindromas may transform into a malignant form. This change is more frequent in solitary cylindromas. Scientists used to believe that cylindroma was of apocrine differentiation. 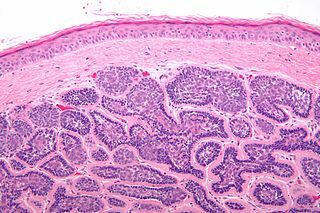 Further investigation confirmed that there are several histological characteristics of the tumor and that it exhibits apocrine, eccrine, secretory and cytomorphological characteristics. Cylindroma occurs as a slow growing rubbery skin lesion. As it has already been mentioned it predominantly forms on the scalp and forehead. The tumor may also occur on the neck and trunk. Multiple tumors generally form in groups and in a small number of patients the tumor/tumors are reported to be painful even though this is not the general characteristic of cylindroma. In the United States cylindroma is not frequently reported, therefore it is not considered a common skin lesion. This is the reason why the tumor incidence remains unknown. Similar data is collected in other countries around the world. Majority of these skin lesions are benign and cause no significant problems. However, in small number of patients the tumor may progress into a malignant form (at least 14 cases of malignant transformation have been reported). Tumor equally affects all races. As for gender, women are affected more. Multiple tumors form unappealing masses. Such tumor collection may be disfiguring and require extensive reconstructive surgery. Cylindroma is easily dealt with a surgical excision. The scar is not visible. Apart from excision, the tumor may be removed with electrodessication, curettage and cryotherapy. Small skin lesions can be easily removed with carbon dioxide laser. Laser therapy is recommended for individuals with cylindomas located on the face. Multiple cylindromas require more complex approach. The extent of the surgery depends on the size of tumor collection. Treatment may need to go through several sessions when the surgeon progressively performs excision of a group of nodules. Reconstructive surgery is necessary in a certain number of patients who have to deal with large-sized tumor collection. What Causes A Lump Near The Ear? Cancer Treatment Myths - Believe Them Or Not? Anyone had any experience with Pre-Renal Para aortic Lymphangiomyoma??? Can radiation stop tumor from spreading in pituitary gland?